My Eyes are gone is inspired by a true story. After surviving a traffic accident and after seeing the woman he loved die from ovarian cancer, Félix recalls the memories of his own injured and sick body. In slow, circular panoramic shots, the camera travels, defines, discovers the space of a large apartment shrouded in shadowy light. It’s in this labyrinthine and inextricable space, while simultaneously in Félix’s body (which delimits the immobile physical space of the site), that his words circumscribe a complex mental space shaped by the obsession with organising and staging his own disappearance. Lives and works between France and Italy. Her artistic practice is situated at the crossroads of video art, documentary and cinema. She is interested in narratives and in the intimate spaces of individuals anchored in a territory, in solitude. Her works have been shown in group exhibitions, and projected during the Rencontres Internationales Paris/Berlin/Madrid at the Palais de Tokyo, but also in Valence in Spain, at Mr. Pink gallery as part of the Screens-digital vidéo création series. 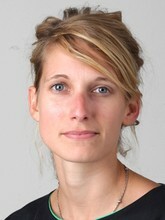 In 2014, she won the Félix Sabatier prize for her video Ours (Les nôtres). DNAP à l’ESBA de Montpellier. DNSEP à l’ENSBA de Lyon.